After spending a few uneasy minutes, the badger is comfortable with my presence. There’s a prairie dog town not too far from where I’m staying right now. I often drive by their town to see if there’s something interesting happening. And often, there’s nothing interesting except for their agitated calls warning other town denizens of the presence of a potentially dangerous intruder. Interestingly, pronghorn like to be around this prairie dog town, and there’s almost always a small herd in attendance. Today’s early evening drive to the town was to find a pronghorn so that I could have a nice subject to the moonrise as background. I found a small herd of pronghorn that were very skittish and ran away to another pasture as I approached the town. The prairie dogs scrambled to the nearest holes and a cacophony of alarm calls ensued. Except for a few bold sentinels, a vast majority of the prairie dogs went underground. While photographing the sentinels, I caught a glimpse of a rather large ‘prairie dog’ peeking out from its hole. 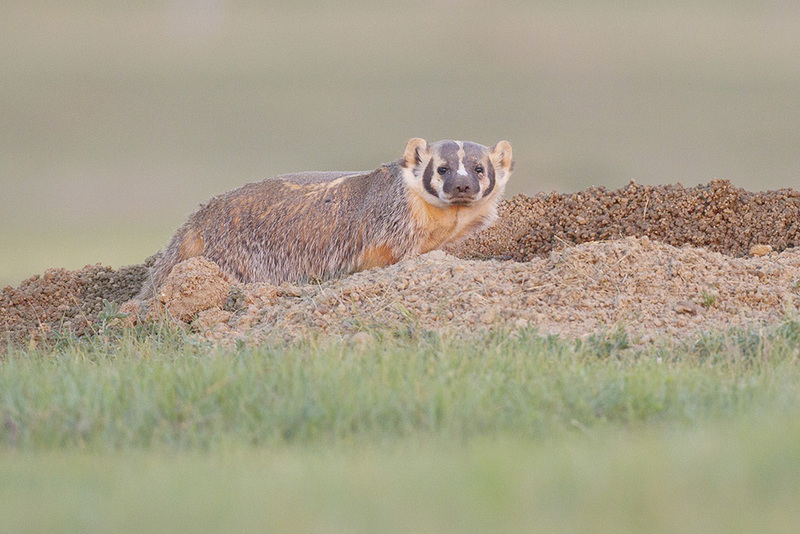 As always, I turned my attention on this unusual prairie dog and instantly recognized it as an American badger! Now, that I wasn’t expecting. I wanted to now photograph the badger instead as it is not an easy animal to find during the hours of daylight. Crawling up to the badger made it wary and it quickly dived back into its hole. There was no option but to wait while lying flat on the grass and hope that the badger wasn’t too shy. Several minutes later, the sun had all but disappeared and I had all but given up on photographing this little fellow. Just then, two glowing eyes peeked up from the hole, and the badger looked right into my lens as it crawled out. It had finally decided that I meant no harm. And then it worked like a trained model – digging, sitting, standing and going on a short walkabout. Perfect. 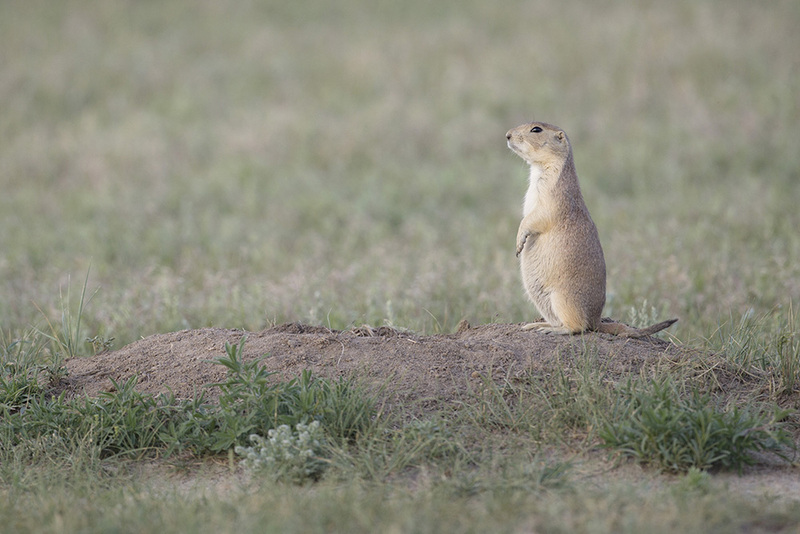 A black-tailed prairie dog sentinel keeps a lookout for danger. 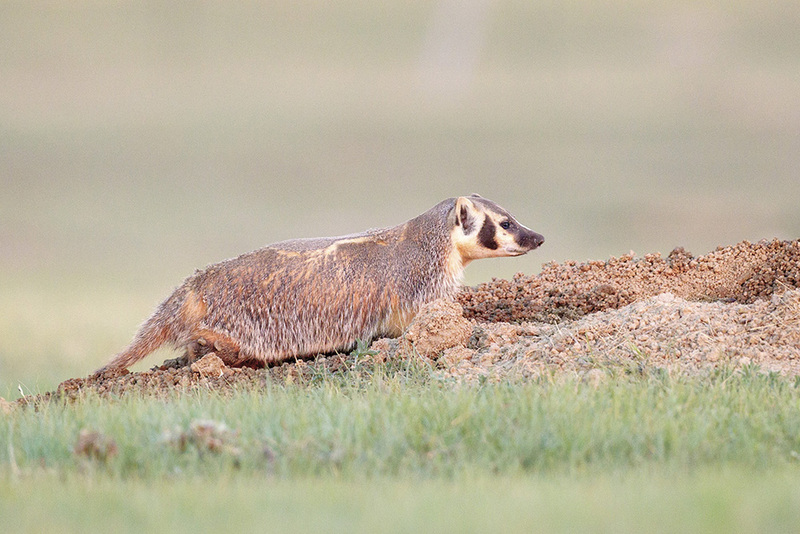 The badger goes about its business of keeping its hole well maintained and sniff-snuffing the air around.